husband of Louisa A. Harden, of 77, Lansdowne Rd., Walthamstow, London. Grave Reference: XIV. E. 20. LIJSSENTHOEK MILITARY CEMETERY Poperinge, West-Vlaanderen, Belgium. 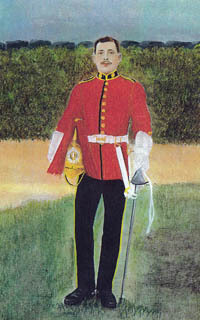 The Queen's (Royal West Surrey Regiment) 1st Bn. Son of George Harding and Ellen Day whose marriage was registered in the second quarter of 1881 at Lewes in Sussex. In 1901 they were recorded as living at Fletching, also in Sussex. Husband of Annette Mary Harding formerly Wise. of 12, Mint Cottages, Banstead, Surrey. Their marriage was registered in the second quarter of 1908 at Tonbridge in Kent. The following year they had a son also named Harry. The birth of Harry Bertram Harding was registered in the third quarter of 1909 at Ticehurst and the family were still resident there in 1911. 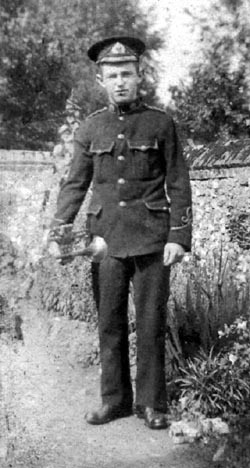 Harry enlisted at Guilford Surrey and eventually found himself at the frontline in France. The war diary shows that the 1st battalion of the Royal West Surrey Regiment were told that they would be taking over the trenches from the 19th Brigade. They marched to Cambrin on the 29 October 1915. This was a small village, about 800 metres from the front line trenches and the diary records sniper activity in the area. Snipers operated on all sides during the war; in static trench conditions the ever-present danger of snipers ensured that it was not advisable for any soldier to raise head or arms above parapet-level, even fleetingly. The quality of sniping was such that fatalities were common even where men exposed themselves to fire for a fraction of a second. This was partly because snipers were expected to thoroughly accustom themselves to the lay of the land which fell within their domain; this included the exact composition of enemy trench lines. Eagle-eyed sharpshooters proved extraordinarily deft at detecting slight changes in geography. "Enemy still showing more activity with snipers, but no shelling on our section. Casualties - Two killed and one wounded." Harry had been shot and killed by a sniper. Of the 1,000 men of 1st Battalion The Queen�s Royal Regiment who landed in France in 1914 only 17 were alive at the Armistice. 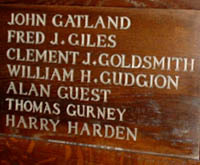 Harry is remembered along with his brother Fred Harding of The Royal Hussars, on the Fletching War Memorial. After his death, his wife Annette went on to marry Charles Champion, in the first quarter of 1917 at Epsom, Surrey. Cemetery: CAMBRIN CHURCHYARD EXTENSION Pas de Calais, France. War diary entries from The Great War Diaries. Sniper activity from First World War.com. 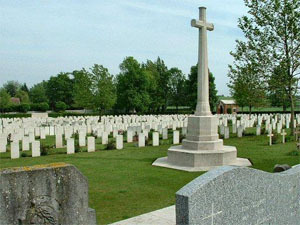 Photo of Cambrin Churchyard Extension by Pieter van Elteren at www.peterswar.net. 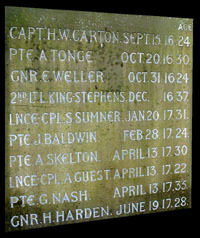 Details of death provided by Geoff Isted who is researching the men on the Fletching War Memorial. Note from webmaster: Geoff has searched long and hard for details of Fred Harding but at the time of writing (March 2009) he has found very little. If you have any information about this Harding family please contact me and I will forward the information to Geoff. Son of Alfred and Helen Hillman, of Park Farm, Banstead, Surrey. Jack was born in 13 July 1899 at Park Farm Cottages, Holly Lane, Banstead. his birth certificate shows the name John but he was always called Jack . His father, Alfred, was employed as a carter and ploughman by Mr and Mrs Garton. They owned the Banstead Wood Estate which included Park Farm and the cottage where the Hillman family lived. 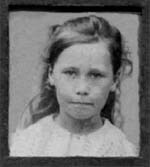 Jack had an elder brother, William, and in January 1905, a daughter, Helen, was born. All three children attended Banstead Village School. This involved a walk along Holly Lane until just past Chipstead Road where they turned right up a path and across the fields which emerged at The Mint public house in Park Road. The route then continued along Park Road until another footpath took them across the Village Cricket Green to the school at the corner of Court Road and the High Street. Helen, had fond memories of Jack giving her a lift on the crossbar of his bike, part of the way to school. When Jack left school at 14 he joined his elder brother William to work as a gardener at Banstead Place. Jack was musically gifted; Helen always said that, he could get a tune out of anything! He was a choir boy at Banstead Church and helped and encouraged Helen when she struggled to master the violin. Jack became a member of the Banstead Silver Band playing a trumpet. This band practised in a barn located near Court Road and Bolter's Lane. The early members were described as 'being pretty poor in terms of wealth - but not in playing prowess'. Most of their engagements were at local fetes and parks, and they often provided the music for open air dances at the Lady Neville Recreation ground. 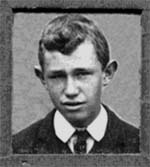 Jack was a lively and likeable character and according to his sister, popular with the girls. 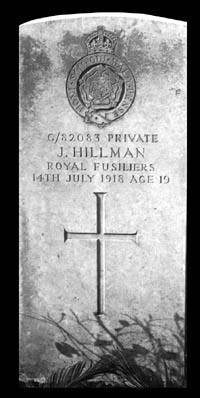 In 1915, his brother William reached the age of enlistment, (18) and off he went to join the East Surrey Regiment. Jack however would not reach 18 until July 1917 but before that time, a white feather arrived anonymously by post. The white feather was bestowed on 'slackers' by chauvinist women in the First World War. The notion of a white feather representing cowardice goes back to the 18th century, arising from the belief that a white feather in the tail of a game bird denoted poor quality. To 'show the white feather' was therefore to be 'unmanly'. Banstead Silver Band uniform . dwelling was demolished around 1950. Jack was a healthy lively lad and someone evidently thought he was older than he was and should be in the forces like all the other eligible men. Jack's parents were stunned and saddened the day that he announced he was no coward, as he had enlisted, months before his 18th birthday. He must have lied about his age. 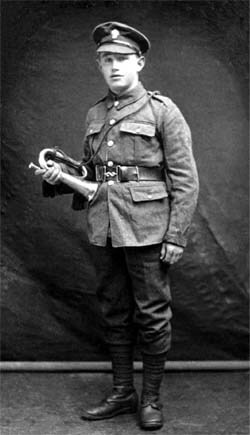 Jack became a private in the Royal Fusiliers and the photograph above shows him carrying a trench bugle which he must have been very proud of. His particular battalion also had a band but of course the battalion had more important work to do at the time. Buglers had more of a practical use on the field of battle but they were used sparingly in WWI. A copy of Trumpet & Bugle Sounds for the Army, with Instructions for the training of Trumpeters and Buglers 1914 states that "The following trumpet and bugle sounds are to be strictly adhered to on all occasions, and no others used in his majesty's service. 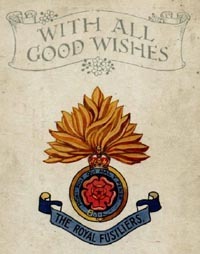 General Officers Commanding, may at their discretion, order all or any of the peace calls to be used on active service". Bugle calls were sometimes used to inspire the men as they made their attack. It was usual that once their training in England was completed, and they arrived ready for war in France, the bandsmen put away their instruments and became stretcher bearers or riflemen. This card was sent to Helen, Jack's sister. It is not known when Jack arrived in France but he almost certainly was there from January 1918. 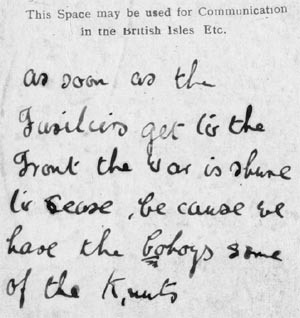 A card sent back home before he got to the front shows his full confidence in the abilty of the Royal Fusiliers who were attached to the 41st Division. This Division was comprised of three brigades each of which had four battalions. Jack was attached to the 26th Battalion of the London Fusiliers known as the Bankers. Originally this was a large battalion of some 1500 men formed in 1915 and made up of bank clerks and accountants from all over the country. They operated in the Ypres salient, the scene of much savage fighting where troops sought shelter in underground tunnels when not engaged in an actual attack or defence. The more elaborate dugouts, as these tunnels were known, were often forty feet deep with a main shaft descending through the layer of blue clay well below the surface. The blue clay was impermeable to water and was the cause of so much mud on the battlefield as the heavy rain had nowhere to go. The Royal Engineers built the tunnels below the blue clay and sufficiently deep to avoid damage from the shells of the German heavy guns. Each tunnel had basic sleeping bunks where weary soldiers, probably officers, could get some respite from the dangerous, noisy and wet conditions up above. 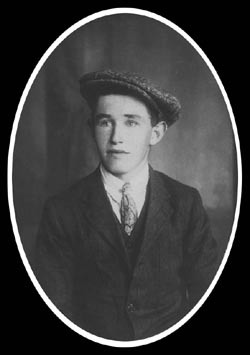 Jack made it to his ninteenth birthday on 13 July 1918 but was to die just one day later. He lies buried with a few hundred others, at La Clytte Military Cemetery, Belgium. 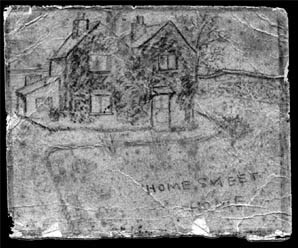 His parents never saw his grave but amongst the items returned to them was a small pencil sketch of Park Farm, Jack's home in Banstead. It is something he carried with him to remind him of 'HOME SWEET HOME' and was almost certainly retrieved from his pocket after he was killed. One of the wood panels in the Lady Chapel at All Saints church Banstead. Grave Reference: IV. F. 12. LA CLYTTE MILITARY CEMETERY Heuvelland, West-Vlaanderen, Belgium. Jack's brother William survived the war but not without serious injury. He was gassed at the Somme and returned to England for treatment. He went back to the front where he later suffered serious wounds to his back, and had to have one leg amputated. After months of treatment and the fitting of an artificial limb, he became the caretaker at Banstead Church Institute. George Hunt was born in India. Later in life, he married Martha and they lived in Ferndale Road Banstead. 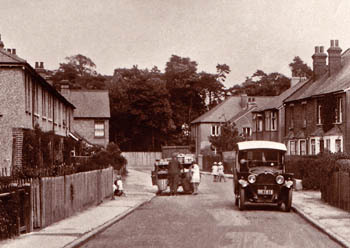 The photo below shows the terraced houses on the left hand side of Ferndale Rd, where three generations of the Hunts, including George Hunt lived. Edith, William, Albert and Alfred. August 1914 : in Bordon Camp. Part of 3rd Brigade, 1st Division. 8 November 1914 : transferred to I Corps. 21 July 1915 : transferred to 5th Brigade, 2nd Division. 15 December 1915 : transferred to 100th Brigade, 33rd Division. The Regimental war diary shows the regiment was in the area of Bethune in January 1916 then Annequin la Fosse and Beuvry. The diary records a relatively quiet period with "ordinary routine" shown against quite a few days. Other entries record patrolling the trenches and occasional shelling. The enemy line was reported to be very thick and unpassable even by a single man. 2 killed 10 wounded. " It was normal practice not to name the lower ranks killed and but it is likely that George Hunt was one of the two men killed on that day. 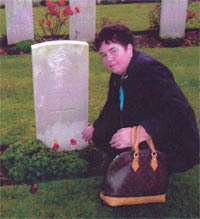 Katherine Barnard, nee Hunt, George's granddaughter researched her family history and made a point of visiting her grandfather's grave in France. 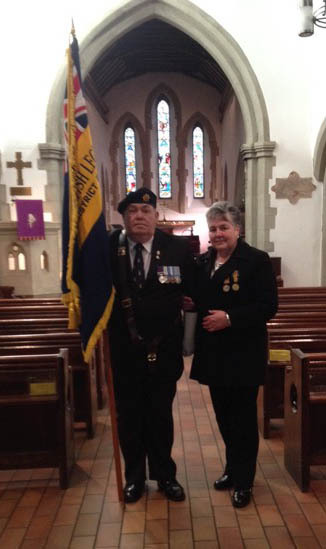 On the 100th anniversary of George's death, Kathy attended a commemoration service at All Saints church in Banstead,where the bells were tolled one hundred times in honour of George Hunt. Kathy was able to wear the very medals awarded to George after a collector found his story on this website and got in touch. Photo on left by James Crouch. 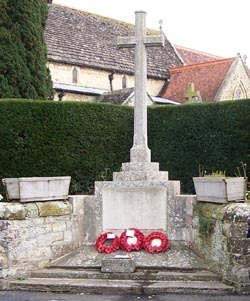 All Saints WWl Memorial Banstead Surrey. Wood panel All Saints Church Banstead.